Hillsboro High participants in First Tech Credit Union coffee shop talk with congresswoman, who has championed renewal of federal aid to schools and career and technical education. 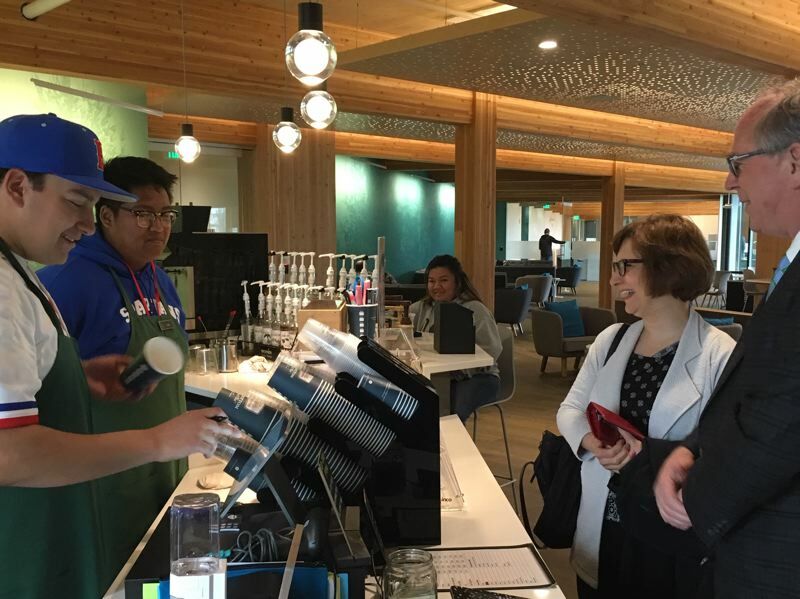 For the price of a cup of tea, U.S. Rep. Suzanne Bonamici heard four Hillsboro High School students talk about their work experience at the First Tech Credit Union coffee shop. All of them are enrolled in the business/marketing course, one of 10 the school offers in career and technical education. The district's other high schools have their own offerings. Bonamici, a Democrat from Beaverton who represents the 1st District congressional seat, stopped by Friday, April 5. She was accompanied by Hillsboro Mayor Steve Callaway, himself a retired teacher and school administrator, and Hillsboro Superintendent Mike Scott. "I agree with you that hands-on education and relevant learning are important," Bonamici said. As a member of the House Education and Labor Committee since she was elected seven years ago, Bonamici helped shape the renewal of federal aid to schools in 2015 and aid to career and technical education in 2018. "At the federal level, we are not going to tell local schools these are the career and technical education classes you have to have. That is done at state and local levels," she said. "But we want to make sure we are filling the gaps for schools. While federal aid provides grants for equipment that school districts seek for their programs, Bonamici said Oregon voters stepped up in 2016 when they approved funding career and technical education programs as part of a ballot measure aimed at improving graduation rates. "Everybody has their own versions of success — and there is more than one way to achieve it," said Koby Sou, one of the students, who said students should be encouraged to look at alternatives to college. Bonamici ordered green tea and Callaway black coffee as they asked students their opinions. "I sit in some classes and I do not learn anything because I am super-bored," Vanessa Lopez said. "But coming into the café, I get really excited and I learn more about responsibility and what it takes to have a business. "I have questions every day I come to work, and I know I will learn something new every time. If I want to get a job at a coffee shop somewhere else, I will have learned a lot." Sou said working at the coffee shop has taught him much about running a small business. "We are all working on small projects on how to better the business," he said. "We love talking with (First Tech) employees about things we are trying to do to better ourselves. It's all about the experience — and once you create a great experience for our customers, they will be loyal to you." Kammeron Mecham said he came into the program halfway through the semester because of Sou's influence. "I like the networking," he said. "You meet all these people who do different things." Nevaeh Alcaire said she has learned about customers' tastes. "I love seeing the customers every morning," she said. "Sometimes they say they are going to try something new, but they always get the same thing." Bonamici said she herself worked in retail for a couple of years after high school graduation in Michigan until she decided to go to college and then law school, both at the University of Oregon. "It helps you learn how things work and also develop communications skills," she said of her early jobs.